I can’t remember when I first encountered Dean Owens music; probably more years ago than either of us care to remember and it was probably when he was a de-riguer support act for touring American acts; and he was always destined to be the headline act. 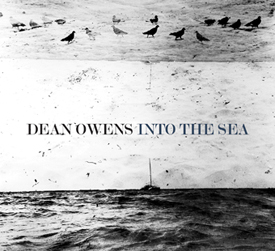 Here on his fifth solo album Dean has finally pulled all of the jigsaw pieces together and created the album he has always deserved to make. Opening track opens with some ghostly electric guitar and a soft bass drum beat before Owens slides in with a tale of a girl born into a Circus family in the early part of the 20th Century and the hook will reel you in like a floundering haddock. There’s a subtle ‘Scottishness’ to the sound Owen’s has created here; and this lends a certain melancholia to songs like Upon the Hill and the sumptuous Days Without You both of which will make you want to curl up into a ball and hug a big fluffy cushion. Virginia Street is a timeless piece of quality Americana that tells a gorgeous tale of a (probable) teenage love affair looked back on through misty eyes many years later; and will ring a few bells with many of us now. On Kids (1979) Owens again looks back on his life; this time to an old school photo of him in 1979 and sadly not all of them; are still with us today and others have taken darker paths than expected. While including a fantastic string section to emphasise the pathos during the choruses; it never sounds cheesy or overpowering but helps move the song into an unexpected new stratosphere. Dean Owens has always had a very sharp and astute way with lyrics; but on Closer To Home he’s managed to combine that with a laid back and gritty sound that’s not afraid to include a melody and nothing showcases that better than the ethereal Valentine’s Day in New York which un-surprisingly got a lot of National airplay when it was released as a single earlier in the year. My copy of the album includes a lovely Special Bonus Track, called I’m Pretending I Don’t Love You Anymore which will be a terrible waste if it’s not on the official release as, although it sounds nothing like the rest of the tracks here, it’s a delicious Country Swing duet with none other than Miss Suzy Bogguss and hopefully serves as a taster for things to come.